Like you, I once wanted to become a car trader. Roll on a few years and I know that you’d like my lifestyle. My wallet is always bursting with cash … all my bills paid … an executive house … a VERY tasty motor … and loads of spare money for holidays and treats. … all this for under two hours ‘work’ a day. 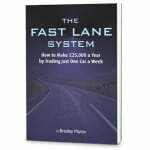 Click here to purchase The Fast Lane System Car Trader digital eBook today. Since I decided to become a car trader I gave up the ‘day job’ years ago. There’s plenty of plenty of room in the car trader business for a LOT more people. If there wasn’t, I wouldn’t be sharing my secrets on becoming a car dealer with you. If you’re sick of being broke, tired of never having enough to pay the bills, let alone having loads of spare cash – then you could be just the person to cash in on this too. This is a great way to make money and you can become a motor trader at whatever level you like. When I first started I knew naff-all about cars. I had no particular interest in them. I’d only ever lifted the bonnet of a car to check the water and oil. I’d a vague notion of how one worked (pistons and stuff!) but that was about it. I’d certainly never stripped one down – and I haven’t to this day. ‘All’ I do is find a bargain car at the right price and sell it at a higher price – and pocket the substantial difference – which can be as much as £2,500 (although more often in the range of £200 – £600). That’s what becoming a trader is all about. Naturally there are loads of dodges, tips and wrinkles which allow me to make great money. 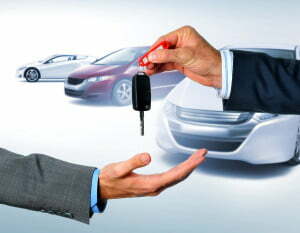 I hope you can see that to become a car dealer is not just a question of buying any old car and hoping to make money. But with what I can teach you quite easily, I know that you could soon be pulling in a few extra thousand a month. 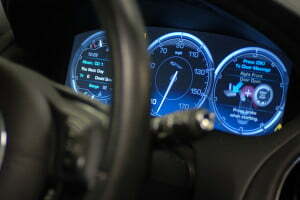 Become a car dealer: Click here to purchase The Fast Lane System Car Trader digital eBook today. Learn To Become a Car Trader – The Money’s Great! Sometimes I make £400 a time, sometimes £900, sometimes a few thousand. It all depends on the car. And we’re talking that sort of money for an hour or so total in effort. There’s no real ‘work’ to do and trading second hand cars is a lot of fun. I admire people who can buy a car, strip the engine down, re-grind the valves, fill out the dents and re-spray it. Lovely job … but that’s NOT what I do. The car trading skills I do have (and would love to share with you) could be applied to anything where you ‘buy low and sell high’. Being a car trader is about finding a hungry seller and a keen buyer, bringing the two together and taking your cut! “To become a car trader: you DON’T need to be a mechanic, you DON’T need to be able to re-spray cars and you DON’T need to be a motoring expert”. If any of those things were required I wouldn’t even have got started. The car trading business really is very easy once you have the ‘insider knowledge’. It has to appeal of course and yes, you to become a car trader you have to put in a few hours of effort. If you’re up for that, I don’t know of another business which can make hundreds of pounds for every hour ‘worked’ like this one can. A widow was selling her ex-husband’s car, a nice Audi, and wanted a fast, cash sale. I bought the car there and then for £3,550 and sold it a week later for £3,975. That took me two hours and I made £475.00 with no outlay apart from a bit of petrol. 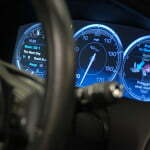 Become a car trader: Click here to purchase The Fast Lane System Car Trader digital eBook today. Become a car trader: it’s one of the best business ideas around. Easy. If you want to learn how to become a car trader I’ve put everything I know in an easy-to-read ebook called The Fast Lane Car Trader System. I’d love to send you a copy so you can get started making this fantastic money too. 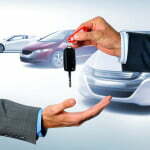 Soon you could be paying off all your debts simply by buying and selling a few cars. It’s taken me six months and a lot of sweat to put down onto paper all of the car trader skills I’ve learned over the years. I made some expensive mistakes when I was first starting out, but YOU don’t have to because I’ll reveal all the dodges, tips and wrinkles you need to know. 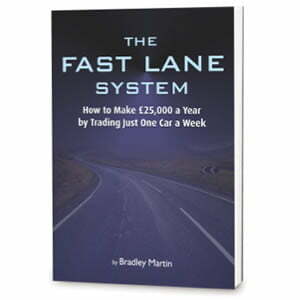 The Fast Lane Car Trader System is a beautifully produced, full colour ebook. There’s no waffle, no filler. Just the plain easy to follow facts which will help you become a car trader and get your new business up and running immediately. You could be making your first car purchase this weekend, and pocketing your first £500 profit by next weekend! Imagine how good that will make you feel! My car trader course is fully illustrated and guides you through this business step by step. I know trading second hand cars can transform your life, as it did mine, but YOU have to want a better life. I can’t drag you kicking and screaming into the good life! The next step to starting your own business. Are you someone who takes action? Or do you only ‘talk a good talk’? Only those who take action make the big money. It’s true, drifters and dreamers die broke and embarrassed. And as an added incentive you’ll see the entire download course is available this month at the discounted price of just £19.97. That’s less than £20 to find out how to make tens of thousands of pounds a year. I don’t think it gets much better than that? It’s time for you right now to take action and buy this car trader course. Thanks for reading. I’m really looking forward to hearing how much money you made on your first deal having read my unique manual on how to become car trader. Any intelligent person of average ability can become a car trader. Remember you DON’T need to be a ‘car expert’ to become a car trader.